Catch-Up Training - Page 2 of 2 - Customised computer training using your gear, at your place, at your pace!! Customised computer training using your gear, at your place, at your pace!! Select cell in row A where you want to insert your first hyperlink. Select Insert tab click on Hyperlink. (Insert Hyperlink dialog box displayed as below). Select Place in This Document. Enter name/reference in Text to display field. 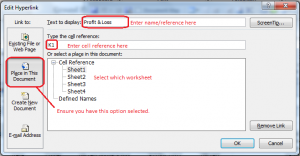 Enter the cell reference in Type the cell reference and select which sheet if necessary. The Mini toolbar was introduced in Word 2007. It appears when you are working with text and objects in your document. Many people love the Mini toolbar, it puts commands right where you need them most – immediately beside the part of your document that you’re editing. The quickest and fastest way to select a word, sentence or paragraph of text within all Microsoft versions of Word by using the mouse and keyboard keys. No more clicking and dragging the mouse with varying results! You can automatically colour specific incoming emails. By doing this you will immediately know when you have received a message from an important client or someone special. It’s easy. In the Inbox, select the email (sender) message you —- want to colour code. Click on Tools menu, click Organise. In the Inbox, select the email (sender) message you – want to colour code. Click on Using Colours (email address highlighted). Close the Organise pane by clicking the X in the upper-right corner of the pane.